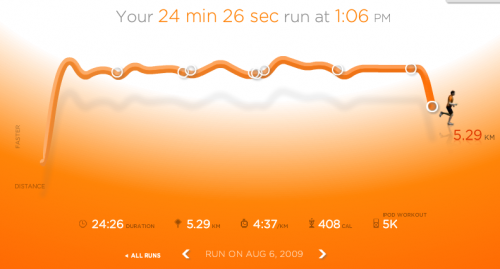 A little late to the party, I just realised that there’s a new Nike+ website with an all new design and much improved performance - so time to update the shots of my stats. See my previous post for the before shots. Everything is themed in orange due to my Nike+ “level” being the second tier where I’ve logged more than 49K (yellow level) and less than 250K (green). Two more kilometers and it’s into the green. There’s also a new social feature that allows you to add friends and share your profile - so here’s mine.